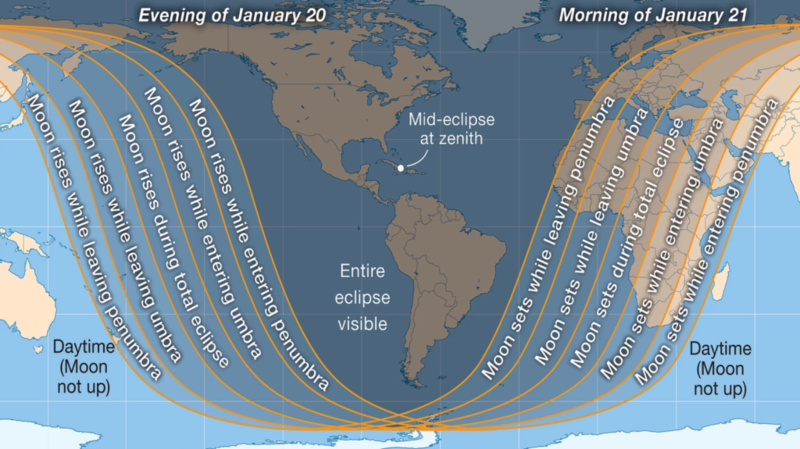 BBC and Space.com: The moon will pass through Earth’s shadow tonight in the only total lunar eclipse of 2019 and you won’t want to miss it! If you miss it, you’ll have to wait two years for the next one – the next total eclipse won’t happen until 2021, and the next blood moon will only be visible in our region in 2022. Skywatchers in the Northern Hemisphere (see “Complete path of the 2019 Super Blood Wolf Moon eclipse” photo below) will get a celestial treat tonight, Sunday (Jan. 20) and early Monday (Jan. 21), when the moon goes into eclipse and turns blood red. The moon will turn a striking shade of red. It will be called a wolf moon because it will happen in January. Combining the above information has led many to call tonight’s lunar event a “Super Blood Wolf Moon“. The partial stage of the lunar eclipse begins at 10:34 p.m. EST Sunday night with the total eclipse beginning at 11:41 p.m. EST. Complete path of the 2019 Super Blood Wolf Moon eclipse. Is it safe to look at? Can I View It Online? You are no longer servants, but Royal sons and daughters, can you see my answers over your lives? Release the pain to me at this hour, anything that keeps you away from everything I have for you. Stand firm, many will come to steal what is yours, stand firm, grab a hold firmly. I am restoring and replenishing your soul at this hour, now is your time to come forth and shine. Many get stuck in the wrong moment, I have come to free the captives so what is holding you back? You must decide to not stay stagnant. Discover who you truly are, be still for my burden is easy. You are an overcomer so hearken up your praise unto me this day. Behold I am knocking on the walls of your heart and if you call me I will listen, let me silence those who mock you. I am going to shake the religious beliefs between you and my church. What was will not be, so shake off the condemnation and the shame from your past. Understand what faith can actually do so look for my hand, no more will you live in your own success. You will see just how blessed your are; gratitude is key, for it invites me in and have a sit. I want you to see yourself as I see you, I have your hope now I want your trust. You are about to fly with the courage of an Eagle in the eyes of a Hawk. You are not Lord of what you see, my idea of being free is that your burdens are not yours, but mine. In the coming days, you will see that I am for you, I did not create man for perverseness and trouble. Doctrine of devils will become prevalent soon but they will not stand and will not flourish. Oh how I waited for this day. For those who preach my words, prepare for your blessing, choose wisely, the time is upon you my bride, when I will wash you with very severe persecution. The time of your filthiness, choose wisely! Who will you turn too when the banks are closed and your wallets are empty, who will you choose? My people, I have ordained how long you will remain on the earth. Set your house in order. A time of great grief is coming, you will be persecuted and you will grieve at what is coming. You can only survive what is coming only if you know me. I am he who is faithful and true. The writing is on the wall, only the spiritually blind will not see it. In the coming days, where will the wicked and the Luke-warm run from me? And to who will they run to for help as the great “I AM”, thunders from the heavens? I will expose the deception and all that have been dead will come to life. Rejoice my bride, my beautiful ones, open wide your hearts as the kingdom dwells among man. Hallelujah, Hallelujah; For your king is with you…..Yahoshua! *These are the prophesies of Yahoshua.